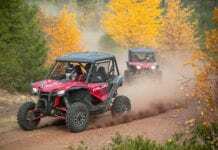 With the 2015 Honda Pioneer 500, Honda creates a compact, affordable, trail-capable two-person side-by-side that works hard and plays hard. 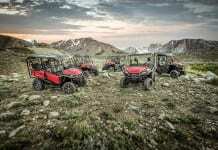 Following the successful launch of the revolutionary 2014 Pioneer™ 700 and Pioneer 700-4, Honda continues its side-by-side expansion with the 2015 Pioneer 500. 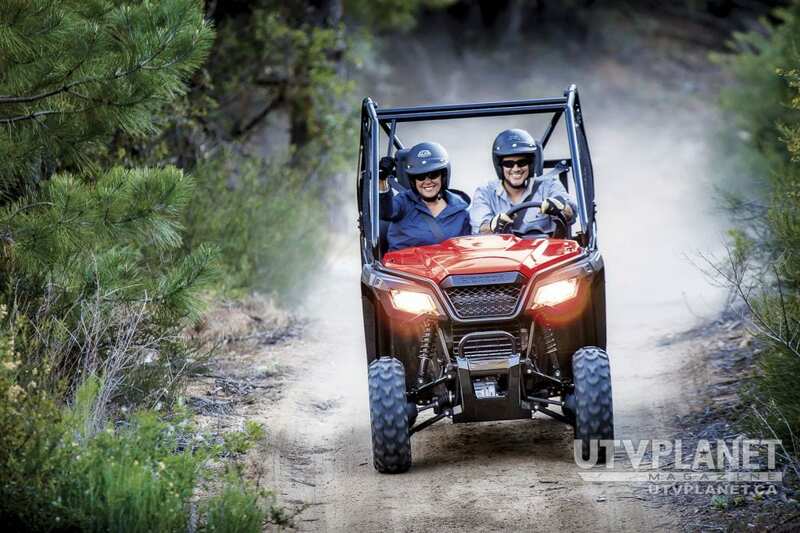 Compact, versatile and fun, the two-person Pioneer 500 side-by-side is equally adept at off-road recreation or tackling a wide variety of work applications. 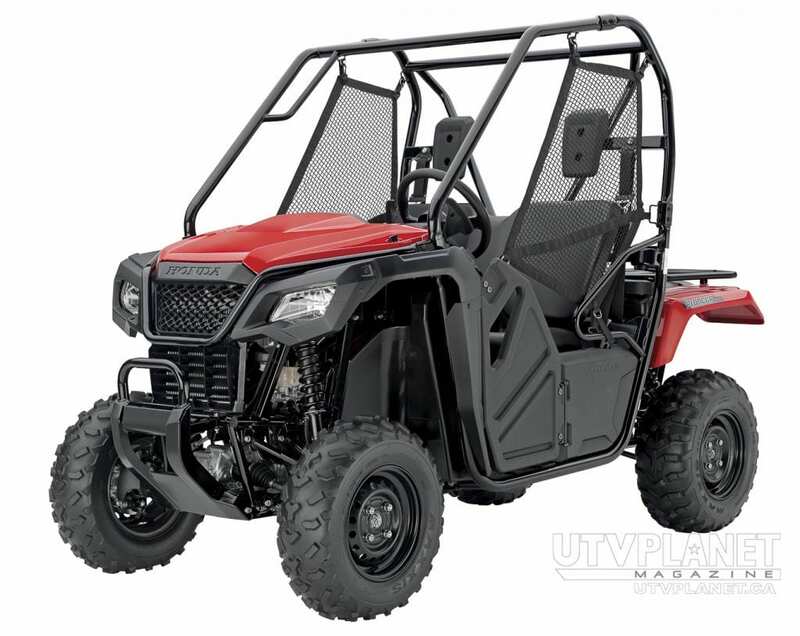 Sized to fit on trails that impose width restrictions—as well as in the bed of a full-size pick-up truck—the Honda Pioneer 500 was designed by Honda R&D in Ohio, and built at Honda South Carolina (HSC) in Timmonsville using domestically and globally sourced parts. Its compact size and affordable price provides attainable access into the side-by-side category for a larger group of four-wheel customers. 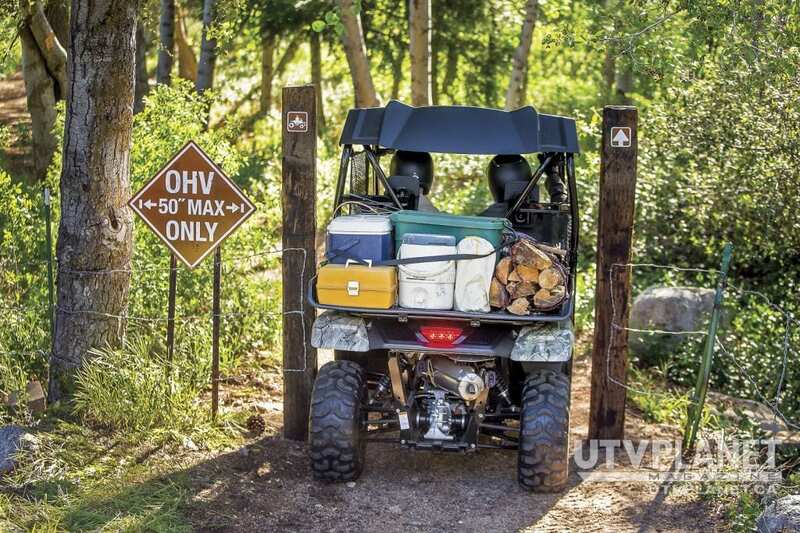 Recreational riders are encountering restrictions in more and more off-road areas: trail access for off-road vehicles is limited to those with a width no greater than 50 inches—narrower than many full-sized side-by-sides. With its brand-new steel ladder-frame chassis and compact 50-inch width, the Pioneer 500 is designed to fit 50-inch limited access trails and allows for convenient home storage. Overall length is 102.5 inches, and a modest 73.1-inch wheelbase helps return agile handling and a tight turning radius of only 13 feet. Double-wishbone suspension front and rear with durable steel A-arms yield 5.9 inches of travel that’s plush enough for a comfortable ride, yet progressive enough for most off-road trails. The rear shocks offer spring preload adjustability to alter the ride for light or heavy loads. The rear suspension also features a stabilizer bar system, reducing body roll when cornering. 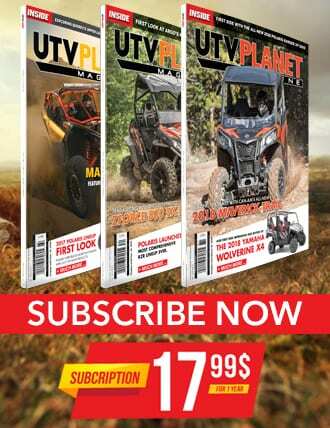 24 x 8-12 tires help give the Pioneer 500 a quality steering feel and ride. Its compact size and affordable price provides attainable access into the side-by-side category for a larger group of four-wheel customers. Powered by Honda’s proven longitudinally mounted 475cc liquid-cooled overhead valve single-cylinder four-stroke engine, the Pioneer 500 features plenty of low-end torque, and a smooth easy-to-use powerband that makes it fun to use in a wide range of environments. Honda’s Programmed Fuel Injection (PGM-FI) system ensures accurate fuel metering and great throttle response under many different riding conditions, including high-altitude operation. 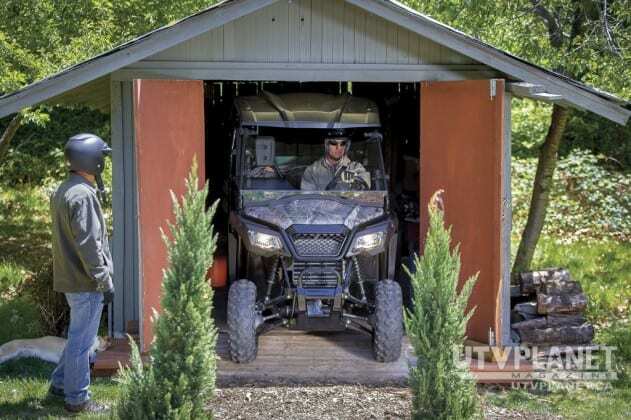 Additionally, the Pioneer 500 incorporates an oxygen sensor and catalytic converter in the durable stainless-steel exhaust system, which increases fuel-metering precision while also allowing the Pioneer 500 to meet exhaust emissions requirements. Power is transmitted to the wheels through a five-speed gearbox with reverse that uses an electric shift system featuring paddle shifters mounted on the steering wheel. 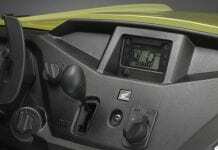 Pull the paddle on the right side for upshifts, or pull the paddle on the left for downshifts. The familiar layout and function of this system is similar to what’s found in Honda automobiles and provides the driver with a fun recreation feature and useful gear control for work. Reverse is easily engaged via a dash-mounted lever, and gear position is displayed on the centrally located digital meter for convenient reference. Shift engagement from one gear to the next in the Pioneer 500 is notably smooth, thanks to a shock-absorbing judder spring in the clutch assembly and a momentary fuel cut during shifts that helps smooth the transition from one gear to the next—two innovative bits of Honda bright-think. 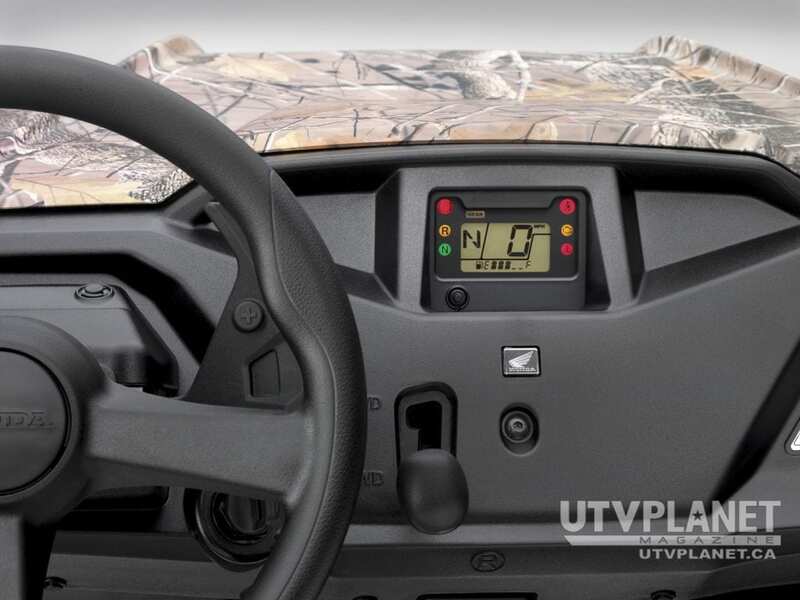 Power is transmitted to the wheels through a five-speed gearbox with reverse that uses an electric shift system featuring paddle shifters mounted on the steering wheel. 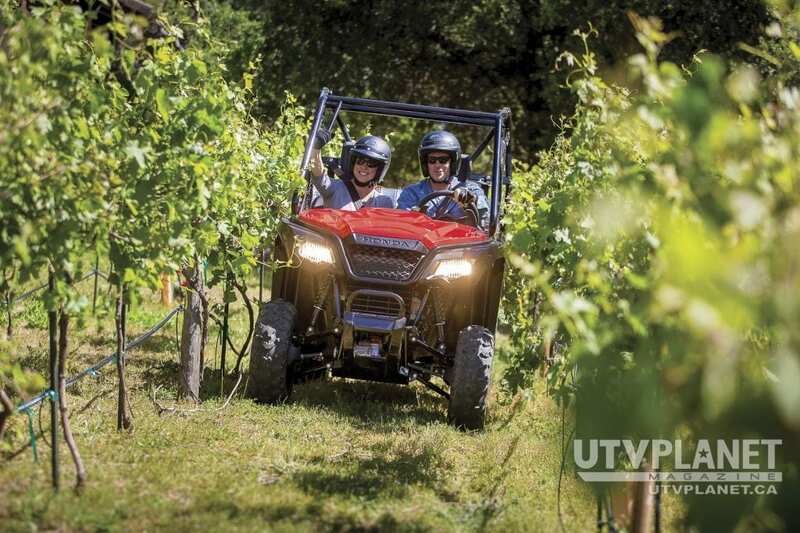 On downhill slopes, the Electric Shift transmission allows the driver to hold a gear for positive engine braking that supplements the 200mm hydraulic front and rear disc brakes for slowing power, a welcome feature. With its 1,000 pound towing capacity and ability to hold a lower gear, the Pioneer 500 has the ability to tackle big jobs in a variety of terrain. Final drive is handled via shaft, and a handy gearshift selector makes it easy to switch from 2WD to 4WD when the going gets tough. 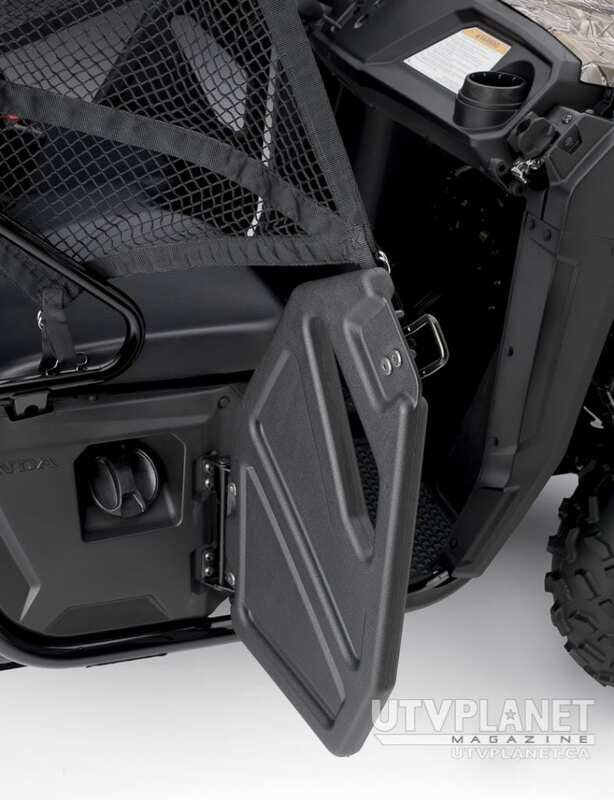 To climb into the Honda Pioneer 500, you merely twist the door release knob, and the door and net open together as one unit—an ingenious and simple design. The knob is easily accessible from inside or outside of the vehicle. The door swings open a full 180 degrees for easy entry and exit. Inside, there’s a roomy and comfortable bench seat for the driver and passenger. 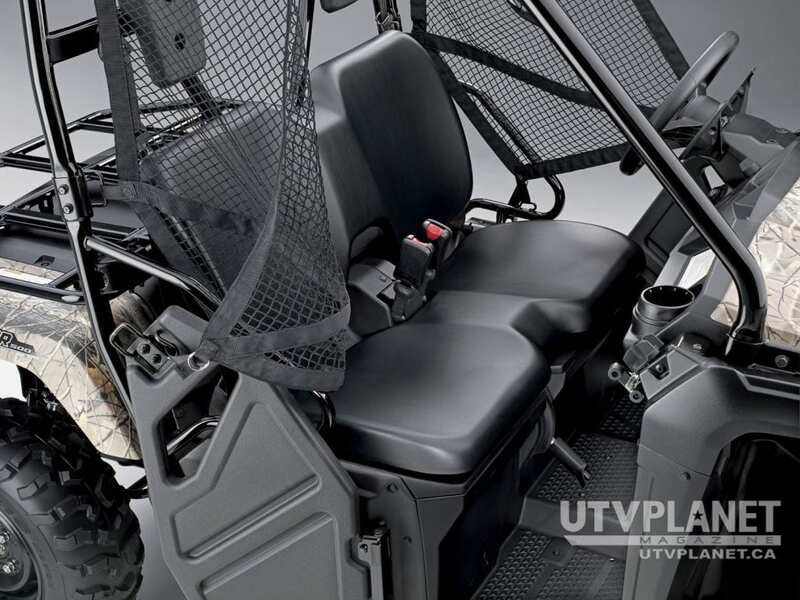 The Roll Over Protection Structure (ROPS) meets OSHA requirements, and there are three-point Emergency Locking Retractor (ELR) seat belts. In back a large, flat rear carrier built of sturdy steel tubing provides a big space measuring about 30 inches by 46 inches wide. 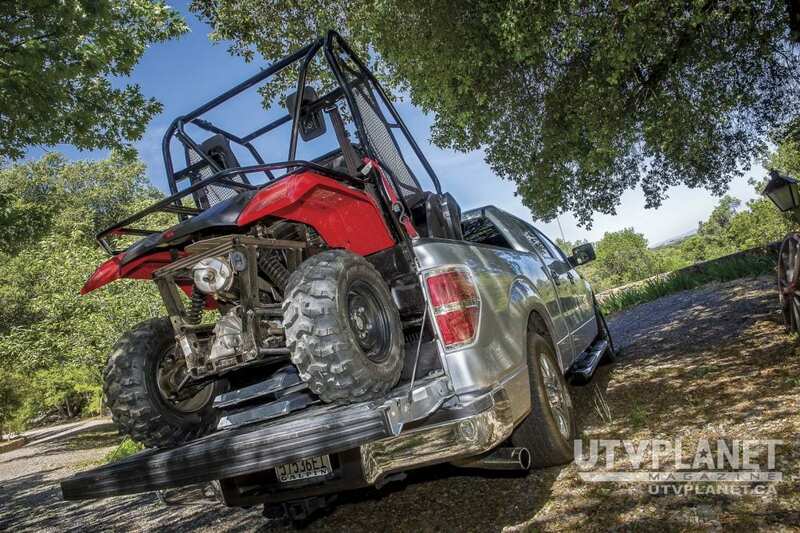 With a deck height of only 37.5 inches, the rear carrier is an easy lift for packing your gear on board. The rack is rated for a load capacity of 450 pounds, and multiple hook points for tie-downs are conveniently provided all around. 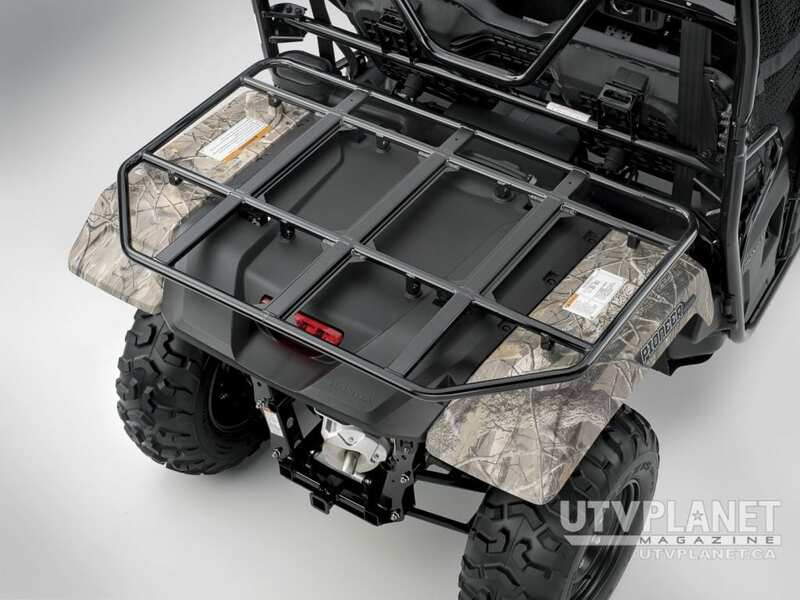 There’s plenty of room on the rear carrier for users to add specialized equipment or an enclosed box for parts, tools, or camping gear. The options are nearly endless. 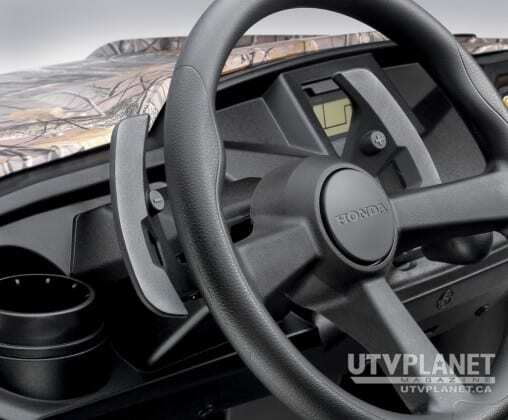 There’s also more than 40 Honda Genuine and Signature Accessories that allow owners to configure their Pioneer 500 to meet their specific needs right off the showroom floor. With new people entering the growing side-by-side market, the Honda Pioneer 500 provides a whole new level of accessibility—both in its versatile capabilities as well as its exceptional value. Attention to detail counts for plenty, and as would be expected, the Honda Pioneer 500 is up to full Honda spec in this area. Access for pre-ride maintenance items, such as brake fluid, coolant level, and oil level, is simple and requires no tools. Thoughtful touches in the rider compartment include dual headrests, two-cup holders and a 12-volt power outlet. The hood, seat back and seat bottom can be easily removed as needed for access to the oil dipstick and air filter. And multi-reflector halogen headlights offer plenty of illumination should your rides stretch past sundown. 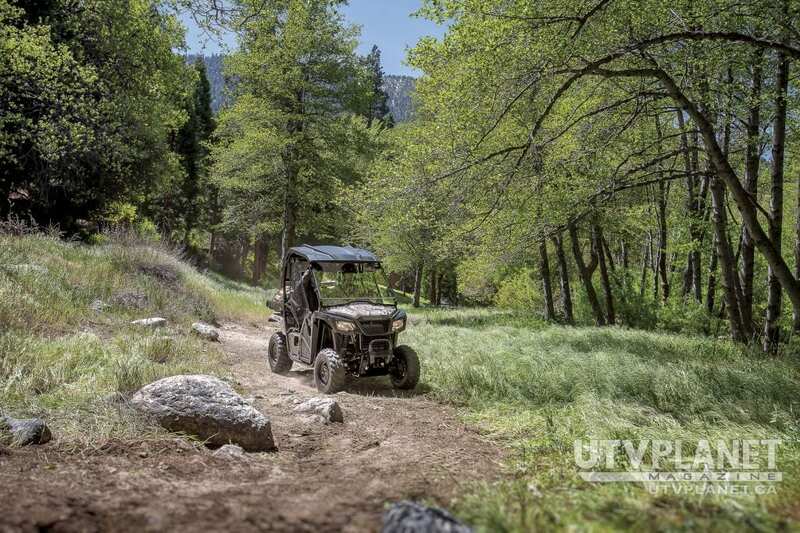 With new people entering the growing side-by-side market, the Honda Pioneer 500 provides a whole new level of accessibility—both in its versatile capabilities as well as its exceptional value. 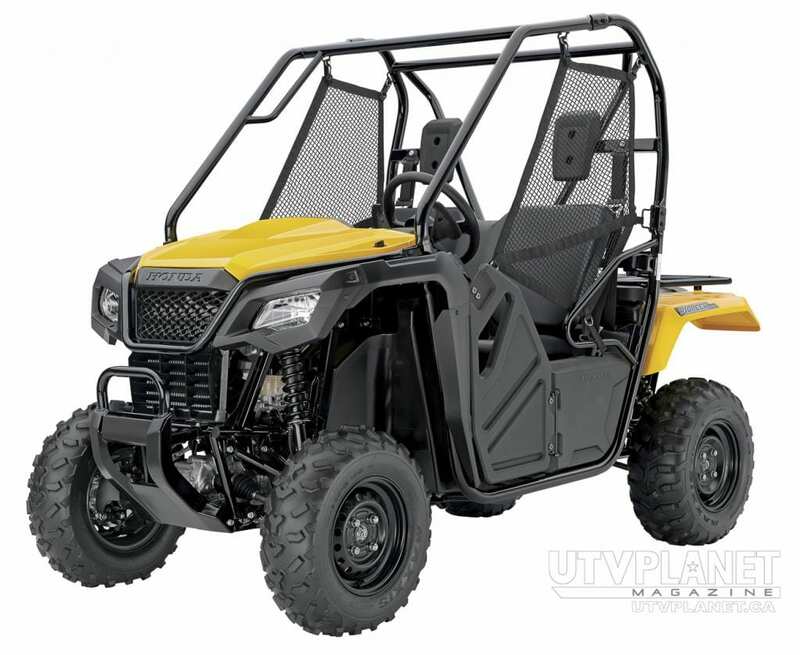 Compact, easy handling and trail-ready, the Pioneer 500 offers a highly affordable fun alternative for recreational riding, outdoor sports, chores around the homestead, the job site, and so much more. 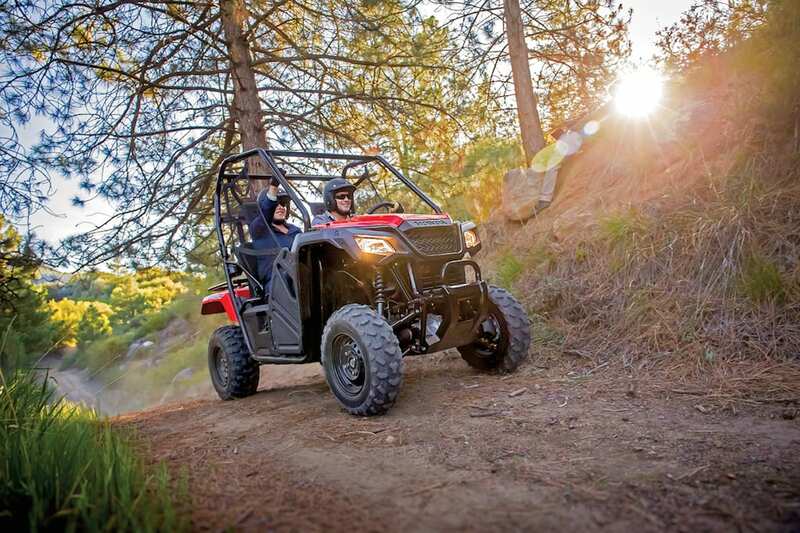 From side-by-side enthusiasts to new riders, the Pioneer 500 is likely to become an instant favorite. 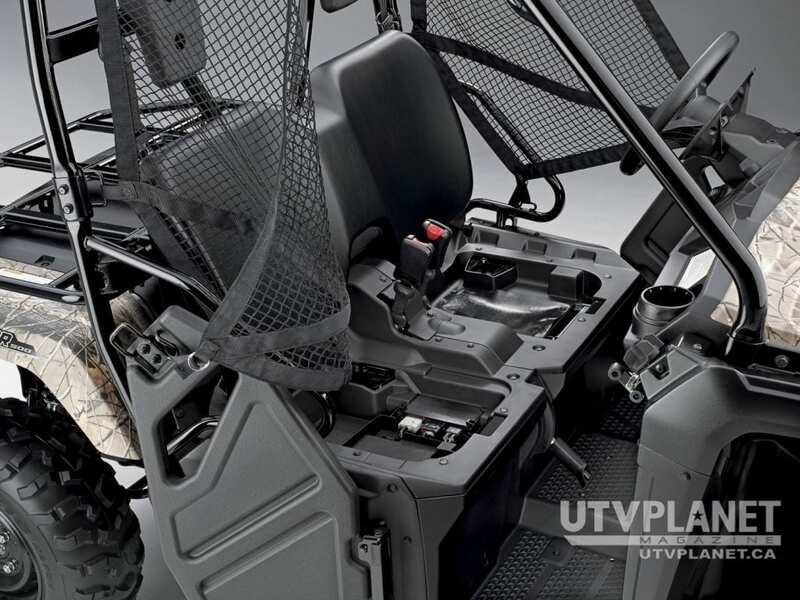 New chassis with compact dimensions: 102.5-inch overall length and 73.1-inch wheelbase. 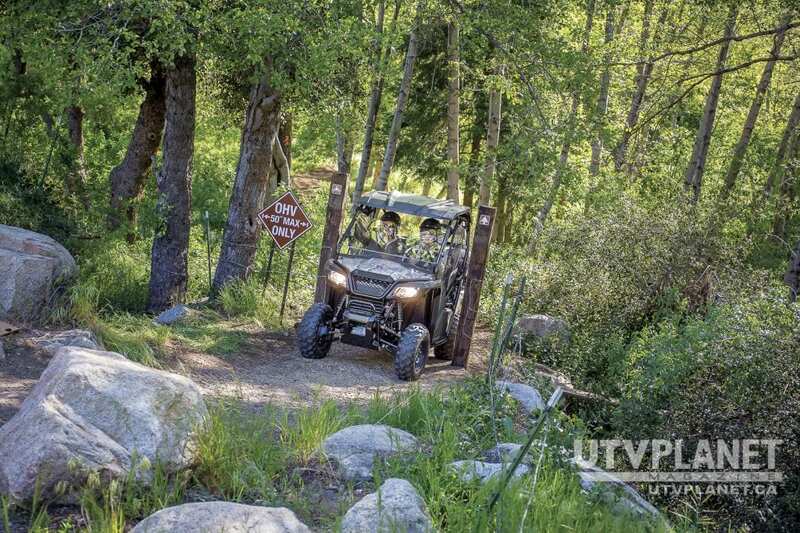 50-inch overall width allows access to width-restricted trails. 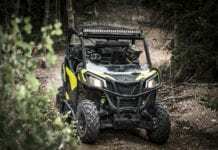 Fuel-injected engine provides great performance and excellent fuel efficiency in a variety of conditions. Five-speed gearbox with reverse and a LOW first gear uses an electric shift system featuring paddle shifters mounted on the steering column. Twist-action door release knob opens the door and net together as one unit. Hydraulic disc brakes front and rear. Large, flat rear carrier offers a load capacity of 450 pounds and multiple hook points for tie-downs. Towing capacity of 1000 pounds to take on tough jobs. 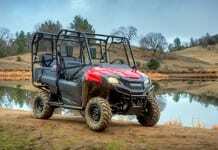 Full line of Honda accessories adds weather protection, storage capacity and expanded functionality.